The oldest Sub Section in NSW having received its charter before the inauguration of the NSW State Section, Newcastle Sub Section continues to be an innovative and active Sub Section in NSW. The Sub Section meets at the Gallipoli-Legion Club in Hamilton, a central Newcastle suburb and has an interesting social program. Service Medal to the family of the late Able Seaman Phillip Rose, who sadly passed away in 2002. The medal recognised Phillip’s service in border protection. It was accepted by his brother Graeme, who also served in the Navy. It proved to be a very moving and memorable occasion. CN spoke very highly of Phillip who had once served with him when he was in command of HMAS ARUNTA. Twelve Sub Section members and some wives were in attendance along with Sub Section Secretary LEUT Steve Dunne, ANC (CO, TS TOBRUK) and three cadets. Also present was former CPO Coxswain Ian Jackson and his wife Sharon. Ian served with CN in the 80’s when he was Navigator of JERVIS BAY. in the presence of VADM Griggs, to remember our shipmates who were lost in the VOYAGER/MELBOURNE tragedy, 49 years ago to the day. LEST WE FORGET. Chief of Navy Crest to Mr Michael Cleary, CEO Gallipoli Legion Club, to thank the Club for its assistance on the day. 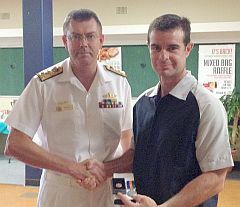 The accompanying photograph shows VADM Griggs presenting the Operational Service Medal to Graeme Rose.